Starting a bit off topic, this is the 100th post on this blog, and I want to thank all the readers and fans who have supported it so far, and hope they will continue to do so in the future. Back on topic, I was hoping for something good to take the 100th post, but instead have been left with reviewing Naruto Shippuden 259, which did nothing other than make me angry. This episode started with Gaara vs Sasuke in the forest just as Gaara was in his partial transformation form, and it ended shortly after the Sound Ninja 4 invited Sasuke to join Orochimaru to gain power. Something I did like in this episode was the music choices, with even the unreleased version of Sasuke’s Destiny (last heard during the flashback to Sasuke showing his father the fireball jutsu) getting a run out. It’s really nice and nostalgic hearing the themes again, and it certainly does bring back some good memories of the series for me. I also have to say that this episode was put together far better than the last one was. Although there were obviously big parts skipped over and certain scenes edited, it was at least coherent and made sense this week, where with the last episode it was like they just threw random parts together for a laugh. However, I ask that you forgive me in advance, as I feel a bit of a rant coming here. Now I don’t like filler, 99% of the time it’s god awful and just painful to watch, but I still except it for what it is and don’t really have much of a problem with it. We also know that in these filler episodes, they will often add a few new scenes or certain lines by characters, which again, I mostly don’t have a problem with. What I DO have a problem with however is what they did here, that being adding words / thoughts to characters that contradict canon and who they are. If you haven’t seen it, I am referring to a scene from the Sasuke vs Naruto rooftop incident. For those that watched the original Anime or read the Manga, we know that after all the recent events Sasuke had become extremely angry and jealous of Naruto to the point where he just wanted to fight and beat Naruto to prove to himself that he was stronger, but in this filler, they decided to add some thoughts coming from both Naruto and Sasuke that weren’t included in the originals. 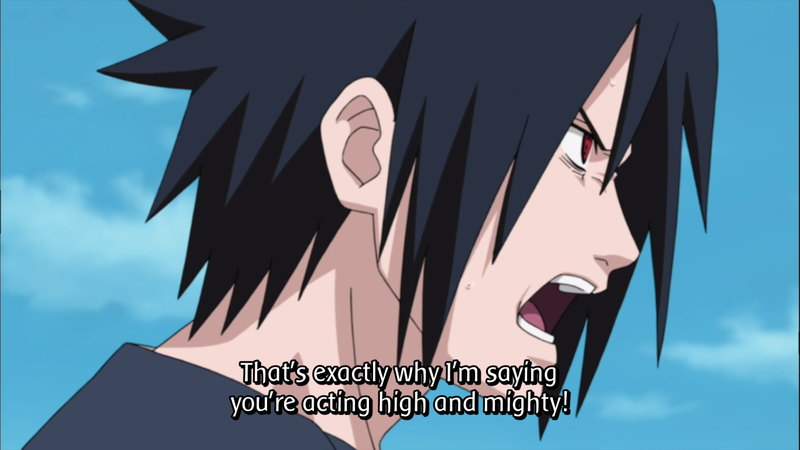 While in the Anime and Manga Sasuke and Naruto were both on the roof basically trash talking and winding each other up, it was always pretty clear (for Sasuke at least) that this fight was something he wanted to do and had no regrets about either. In this episode though, even while they are talking to each other (like in the above pic), the Anime team decided to add thoughts coming from both Naruto and Sasuke which were along the lines of “I don’t want to do this” or “I have to stop this”, which quite honestly annoyed me an awful lot (and probably more than it should have). I know when both Naruto and Sasuke were aiming their attacks at each other during their fight, they both had an “oh damn” moment when they realised they couldn’t stop the Chidori or Rasengan, and that was fine. I just hate the way that they basically added doubts to the minds of both Naruto and Sasuke before a single punch was even thrown in this episode, as it just made it look stupid. I mean, they showed the scene shortly before with Sasuke smacking the plate out of Sakura’s hands, activating Sharingan, and then demanding that Naruto fight him, so for about 2 minutes later to suddenly have doubts is just ridiculous. It was really unnecessary and really cheapened Sasuke’s feelings and actions at the time. Though even moving on from that, this episode I felt did a very poor job of showcasing how Sasuke became so bitter and angry. While it did show his meeting with Itachi, where it was always skipping parts it just didn’t give the same impression or make the same impact. In the originals, we were given time to digest what had been happening, and Sasuke’s descent in to the darkness was played more slowly and with more emotion. I know it’s hardly the Anime team’s fault since they have to rush things, but if you were watching this for the first time without any prior knowledge of what happened with Naruto and Sasuke etc, then it would make Sasuke come across as pretty pathetic or at best make them wonder why he got so pushed over the edge so easily. As much as I hate to admit it, this episode was a lot better than the last one even though I hated the filler between Naruto and Sasuke and the way it made Sasuke come across. At least the music choices were good and nostalgic, plus the editing was mostly fine. I apologise for the rant too and I know it probably makes me come across as a Sasuke fanboy, but I can honestly say that I am not ranting because it is Sasuke I feel is being mistreated, I would be equally pissed off if they did it to someone I am fairly neutral about such as Gaara or Kabuto for example. If you can forgive those moments though, it isn’t a terrible episode by Naruto filler standards, but it’s still not something I could actually recommend watching anyway. My advice – rewatch or re-read the Manga parts of the story if you’re really looking for some nostalgia or want to relive classic moments, as either will do a far more satisfying job than this mini filler arc has. This entry was posted on Thursday, April 19th, 2012 at 8:23 pm and is filed under Naruto, Naruto Shippuden Anime Reviews. You can follow any responses to this entry through the RSS 2.0 feed. You can leave a response, or trackback from your own site. Trying to cram 136 episodes of character development into 4 was always going to be a struggle. I loved the music choices this time round ( go destiny and grief and sorrow!) Still, I have to say that the recaps make the original series look really random, and isn’t exactly the best advert to get people who haven’t seen it to go and watch it. The original series is amazing though… and I find it hard to imagine that there are people who haven’t watched this and yet watch its sequel. On another note, can’t wait till we are back on Canon stuff. Good review as always! Agree 100% with what you said, and thank you! Thankfully the canon will resume soon (it starts early in May if I remember rightly), so I am really looking forward to seeing the war arc!